An author friend, Hope Ramsey, asked an interesting question last week on her blog post: What Happened to My Modern World. She wanted to know if the younger generation’s interest in dark, scary, post-apocalyptic fiction was a rebellion against us Baby Boomers who have over-consumed our way into climate change. Well … given my writer’s interest in the genre, I felt compelled to put some thought into it. I have no pedigree in social sciences and prefer to leave psychology of human behavior to the experts (if there is such a thing). When I blew-off the dust from my college psychology book, the cracked spine opened to Abraham Maslow’s 1943 Theory of Human Motivation. It might have been a sign and I wondered if his Hierarchy of Needs could explain our fascination with a possible future gone awry. Tallying up our current global condition, in addition to the hidden environmental chaos from a couple hundred years of industrial revolution, some would say we underestimated the social impact of an exploding population, and human conflicts that never seem to shut down. I have to balance this discussion with recognition that we would not be at this technological checkpoint if we didn’t have a bit of that industrial revolution that many blame for our ills. However, add the many billions jockeying for space on the planet, most really poor, too many in fear for their lives, diverse and prejudicial moral compass headings spinning erratically; the global village often seems like a global ghetto with entire nations in social and economic bankruptcy. 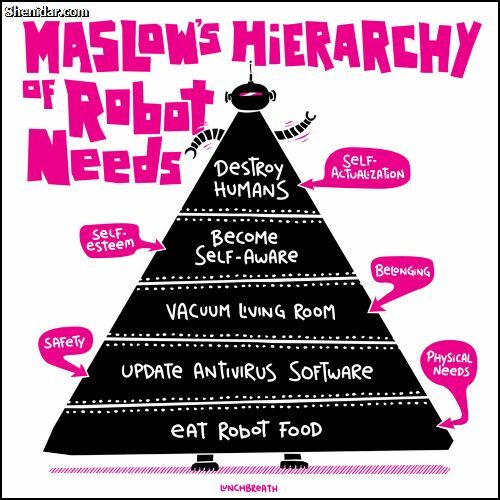 In short, we seem to be stuck in the lower levels of Maslow’s triangle. Let’s tour the floors. Would it be stretching the truth to believe half of the world’s population struggles to get enough sustenance, clean water and sanitation? Safety? It’s better than the dark ages, maybe even better than a couple-hundred years ago, but then I’m blessed to live in a pretty good country. I can think of many places where security and morality is still … “cough cough”… a challenge. Belonging? Strange as it may sound, I think sense of family and friendship as a species is probably one of our best human attributes, even though the subject of adequate intimacy is bound to draw a plethora of jokes and good fodder for the romance industry. Achieving esteem is something self-help gurus make pots of money from and our global advances could be said a direct outcome of the few who have it. Key word … few. Not enough self-esteem to go around. Too many folks mired in the safety and physiological swamp. Our younger generation is more attuned to the world stage than any generation before it. It comes from a closer awareness of global events and the chaos that comes with it. Are they jaded because of our wastrel lifestyle leading to climate change? Humans aren’t robots. It’s a bit more complicated than that. If ole Maslow has any credence on the subject, when we finally do get to a place where at least everyone has something to eat, protection from the elements, relatively safe from thy neighbor, a little more love and R.E.S.P.E.C.T., then a dark, scary, post-apocalyptic world will likely remain nothing more than a good ghost story. With that thought, one could argue that if we don’t get off the lower floors of Maslow’s apartment, a future dystopian wasteland might not be such an outlandish possibility. What about you? Think there’s a connection, or is Maslow just another pseudo-sage who philosophizes with triangular posters? As respects the climate change stuff, there are way too many environmentalists to let that get too out of control. What we need is for all of them to move to China, India and those areas of the world that continue their complete disregard for our environment. Thanks Tom for stopping by and commenting. We humans have had the incredible tenacity to overcome adversity over the eons. I agree on the environmental issue. My concern rests primarily with the vast number of people who live in squalor and in fear for thier lives. Revolutions often become a result of it. Hell, our own great nation went through it. That said, I am addressing fiction, and feel fairly confident it will stay that way. But it does make for great story telling. When I was a teenager back in the day, we thought we were pretty cynical. But we didn’t have internet and all the vast numbers of bad news stories at our fingertips that current teens do, so I imagine, they have their own reasons for being at least as cynical as we were. That being said, I think it’s easier to access good news, too, so maybe that gives them some hope as well. Well spoken, Lynn. You hit the nail on the head. When I was a teen, our cynicism came from weeknight news with stats of the Vietnam conflict and NYC crime. Now, with news from the global village, it seems neverending. There is plenty of good news out there, and our media needs to balance reporting. Unfortuantely, as the old saying goes, “it doesn’t sell papers.” Thanks for stopping by. While they may be more prevalent, stories of a possible future gone awry are not completely new. I remember devouring books like Fahrenheit 451, The Martian Chronicles, 1984, and Brave New World. I think the moral message that was subtly (or in some cases not so subtly) hidden in these novels was the idea that if we weren’t careful, this is what “can happen”. I saw them not as a true vision of the future, but as a cautionary tale of what “could be” if we did not mend our evil ways of greed, war mongering, pollution, prejudice, etc. Very thought-provoking topic, DT! Like you, Marlo, I think it very much a Dicken’s Ghost of Christmas Future. Thanks for commenting. 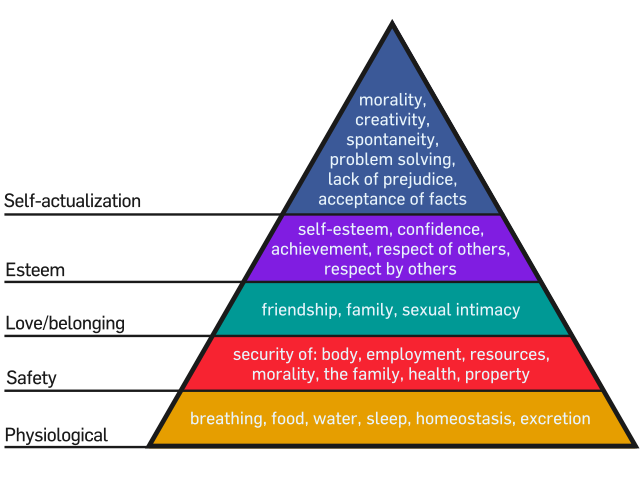 Maslow’s pyramid continues to be valid, regardless how far we evolve, because it’s based on human nature, not human aspiration. Interesting exercise to apply it to dystopian visions, and interesting post, DT. The thing is, the present is far less critical than we assume. There is enough food available on our planet to feed ten billion people (we are seven), but there is no profit for the few corporations who own and ship it, to spread it evenly. We have grown in numbers exponentially only because we eradicated most epidemics through scientific evolution, diseases which only a couple of centuries ago killed hundreds of thousands. We are also continuously multiplying because now there are far fewer wars, with far smaller death counts than before. Global warming has less to do with the 30% of industrialized terrain producing garbage (though that’s certainly a factor), but with the total disregard of natural laws when it comes to the rest of 70%—perverse deforestation, mass killing or hoarding of a previously even distributed grazing stock which kept the terrain fertilized, the systematic pollution of water sources which in turn pollute hundreds of thousands of acres of land, etc. etc. While we grow, we inevitably smother all else that tries to grow beside us. It may be unethical (a rather modern human value), but it’s natural. Ultimately, I believe we live on the side of a coin that wears “Utopia” on one side, and “Dystopia” on the other, and the very thing that keeps that fragile balance is our inherent duality. We’re both creators and destroyers, every day of our lives. We can’t fall either way by our own doing because we’d be going against our nature. Stimulating post! Thanks for pointing me to it. Excellent comment, Veronica. When I read your “Many Faces of the Future”, it reminded me of this earlier post. We are very much double sided coin you describe, and has me wondering if it, like the earth, is perpetually spinning. One moment we face the sun, the next, darkness. Let us hope the coin never stops spinning, even if there’s a 50/50 chance of it landing in the light. Thanks for visiting.